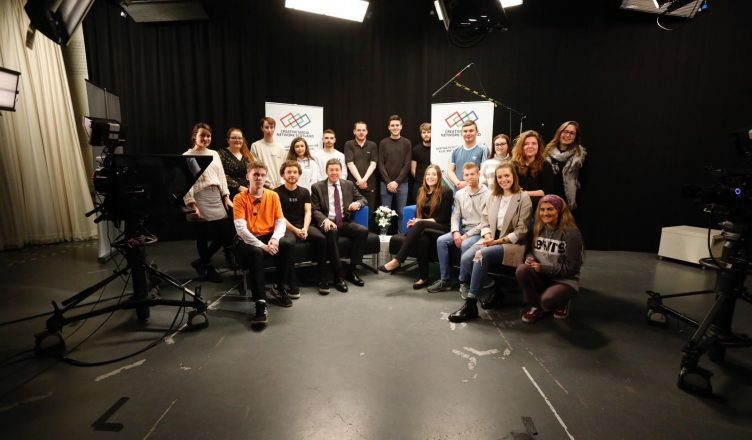 Ken was at the University of the West of Scotland’s Ayr campus on Friday to encourage student film-makers to enter a nation-wide competition to produce a short film on the impact the Scottish Parliament has had in their area. The competition forms part of the Parliament’s 20th anniversary plans and is aimed at students and modern apprentices in colleges and universities across the country whose courses focus on the creative industries. The Parliament is looking for students and modern apprentices to submit one-minute films on the impact Holyrood and devolved governance has had over the last 20 years across all regions and communities in Scotland. Each institution will select a maximum of five pitches for consideration by the selection panel. Thirty of the most promising proposals will be shortlisted. Students will then be invited to pitch their ideas to a panel of leading industry figures. The 20 winners will then be supported by their institutions to produce their final film. The films will be shown during events on Saturday 29 June at the Scottish Parliament, which is almost 20 years to the day since Holyrood assumed its legal powers. This event will see the Parliament open its doors to the public. The competition is being run in conjunction with Creative Media Network Scotland, who work to build links between higher education institutions running creative industry courses and the creative sector. “This competition is all about encouraging students to think about the impact the Parliament has had over the past 20 years, not only to their own lives but in their local area. “For MSPs at Holyrood, it holds out the prospect of new insights and perspectives on the way our Parliament has helped shape Scotland over two decades and hopefully how we learn from that too. For the students, it is an opportunity to work with some of the best film makers in the industry and to have their documentaries screened in the unique setting of the Scottish Parliament. “UWS is delighted to welcome the Rt. Hon. Ken Macintosh MSP to our Creative Media Academy as we celebrate the launch of this exciting new competition. The University is dedicated to supporting the creative industries and nourishing the next generation of talent in filmmaking. “The initiative is a fantastic chance for students to gain valuable experience and the opportunity to screen their films, showcasing their creative flair in front of senior industry representatives. All publicly funded colleges and universities across Scotland who currently teach courses in the creative industries will be invited to take part in this competition. Students interested should contact their course tutor who will receive information about how to take part from Creative Media Network Scotland. Any college tutor who has not received information but would like to take part should contact competition@creativemedianetwork.org. Creative Media Network Scotland is a collaboration of Scotland’s colleges and universities established to mark “new beginnings” in the relationship between creative media industries operating in film, television, broadcast and digital media and Scotland’s Colleges and Universities. Creative Media Network Scotland is funded by the Scottish Funding Council through their Strategic Development Funds. More information on their work is available here: www.creativemedianetwork.org. The Scottish Parliamentary Corporate Body securely processes journalists’ data for the purpose of enabling reporting on the work of the Scottish Parliament, in line with current data protection requirements. You have the right to unsubscribe at any time. For further information, please see our www.parliament.scot/competition-terms.